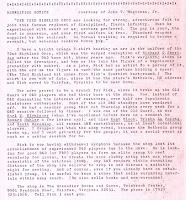 The piece is ostensibly a local-interest profile of a hobby shop in Bethesda called the Grenadier and its owner, Rick Sheridan. But the reporter's attention is immediately drawn to the remarkable game being played there on Thursday nights. Hilts gets a lot of the details and flavor just right: "the players choose a Tolkienic character at the beginning of the game and become that character for the duration of the adventure." He has the Dungeon Master asking the signature question, "What do you do?" Hilts records that it was a large group, and one with significant female participation: "thirteen players, five of them women." Having so many players enabled the crew at the Grenadier to take on the parts both of heroes invading the dungeon and of the key villains below. So our intrepid reporter witnessed the conflict between Duke Richard, played by Sheridan, and a Balrog played by someone identified as Carl. The Balrog had wounded the Duke earlier, but after drinking a Potion of Heroism from a magic pool, the Duke had returned to seek revenge. In another indication of how wargaming principles lingered in OD&D play, we hear that Richard commands a significant following of retainers, both warriors and wizards, and that the Balrog also has a posse of orc followers. Richard's hirelings immediate desert him when he charges foolishly at his adversary. Apparently, Sheridan believed he could charm the Balrog and was quite surprised to learn otherwise: the parenthetical exchanges between player and referee, breaking up the game narrative, convey more about how the game actually feels at the table than is usual for early reporting. The charm failed because Sheridan had cast it at a Phantasmal Forces illusion of the Balrog, we later learn. Consequently, the Balrog captures the Duke, loots him, and promptly offers him on the auction block as a slave. There follows an amusing scene when some of the other players get involved in the bidding, and as a result are themselves captured and subjected to the same indignity. As there is much interest in trying to recapture how people played in the earliest days of D&D, this might prove an instructive example of games where the players provide the opposition and the referee remains neutral. It was a popular style in Twin Cities play that Arneson himself championed. 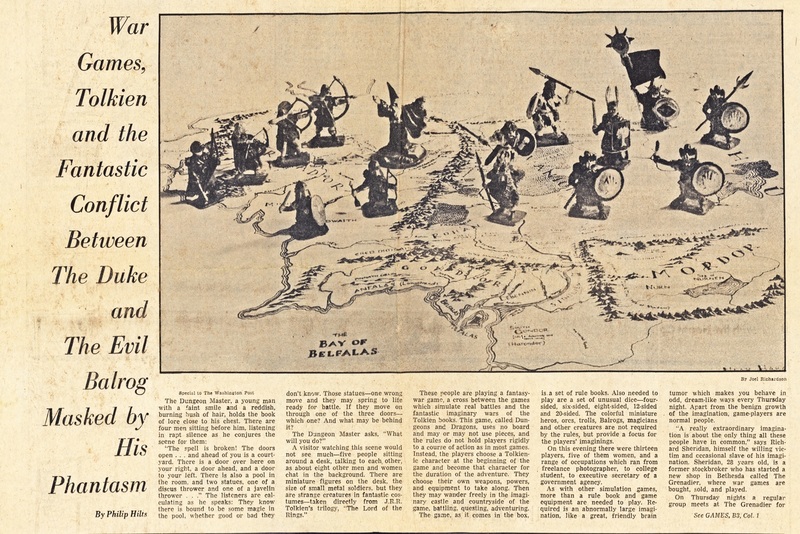 D&D did not immediately sever itself from its wargaming roots: the example of the Duke and Evil Balrog shows this playstyle still in use well into 1976. 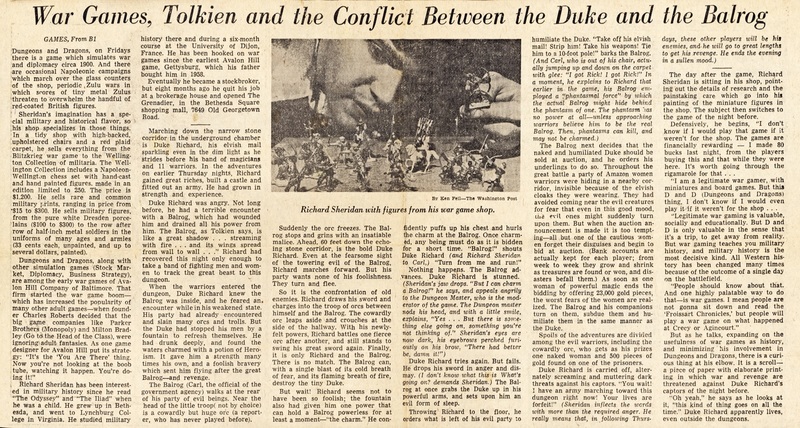 If anything, this article is so focused on wargaming that Hilts mistakes the publisher of D&D: the article lists it as Avalon Hill. The reporter probably is interested in Avalon Hill because they were also a local firm, headquartered in nearby Baltimore. Avalon Hill, incidentally, denies Gygax's later claims that he offered the game to them to publish at the time--but acknowledges that they wouldn't have taken the game at the time if it were offered to them, as they shared Sheridan's embarrassment about the fantastic elements. Wow, what a flavorful article! Thanks for sharing. 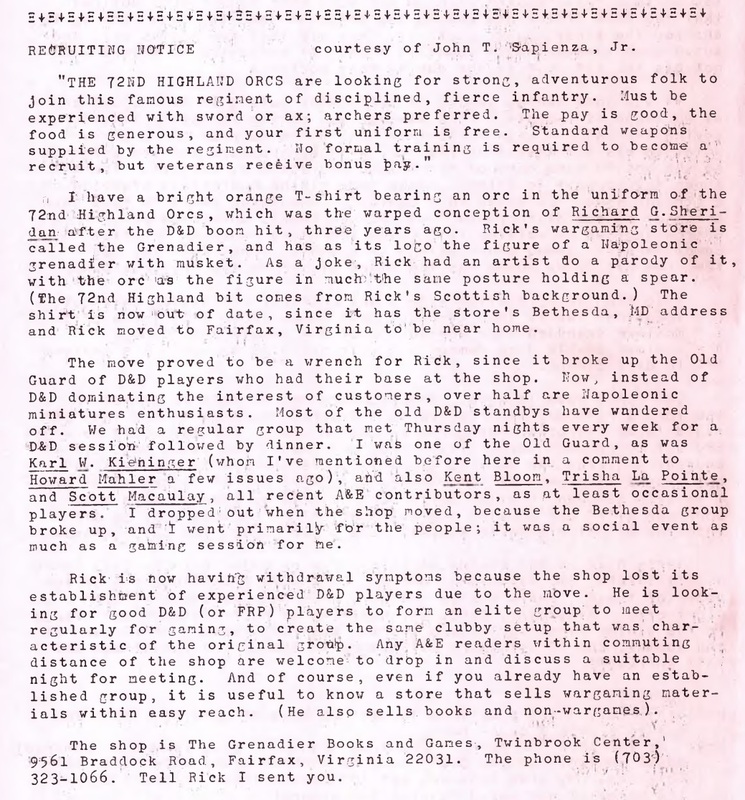 I found one later mention of the Grenadier in the Post, from April 30, 1977, in an article about the shopping center: "...and the Grenadier, which specializes in "militaria" - books, prints, war games and hobby and decorative items. Rick Sheridan, owner-manager of the Grenadier and a 28-year-old "retired" stockbroker, says he chose Bethesda Square partly because the mall's interior is "really suitable for the kind of thing I'm trying to do . . . It conveys the atmosphere of a military tradition." Regardless, another wonderful glimpse into the origins of our hobby. You, sir, are the patron saint of D&D scholarship! I think fantasy is here to stay.